Royal Birmingham Conservatoire has a long tradition of reaching out to communities and musicians of all ages and abilities, across the UK and further afield. Our extensive Learning and Participation programme has reached over 4,500 young musicians and countless numbers of people through a variety of musical activities. 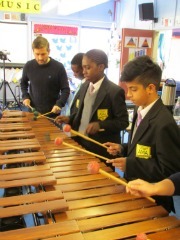 We work regularly in partnership with music hubs, schools and community organisations to deliver a range of opportunities including instrument specific events, workshops,side-by-side programmes, masterclasses and coaching sessions, creative curriculum projects, composition and music technology sessions, and continuing professional development events for school and instrumental music teachers. Our Learning and Participation programme is delivered by professional music tutors at the Conservatoire, supported by students as part of their own professional development. Studying at RBC you will have access to our extensive outreach programme to further develop your skills in education and community settings. The programme impacts positively on young musicians by emphasising progression routes into Conservatoire education. Widening participation in Conservatoire activities to people from all social and cultural backgrounds is a key focus of the programme. In partnership with the Concerts and Events team, we deliver a range of community and education events making our new building are source for people from diverse cultural and social backgrounds. Royal Birmingham Conservatoire has ensembles that are experienced in performing in educational settings. 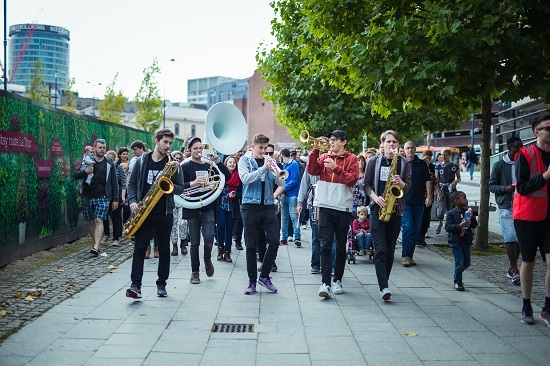 These ensembles range from a chamber orchestra, through woodwind, brass, percussion and string ensembles to world music ensembles, including a Samba band and the Conservatoire Folk Ensemble led by Joe Broughton. If you are interested in a Conservatoire group coming and working alongside your musicians get in touch. The Conservatoire can support these activities and will actively look to find ways to make joint activities financially achievable. We offer a wide range of in-school workshop opportunities with our students and staff to enhance your curriculum. Our workshops range from composition and creative ensemble workshops to specific instrumental workshops or interactive performances in school. There is also the opportunity for school groups to visit the Conservatoire to enjoy our programme of over 300 concerts each academic year. The new Royal Birmingham Conservatoire Aspire programme is for young musicians who show a desire to pursue a musical career. If you are, or know of, a young person that would benefit from an enhanced experience of musical learning activities, including one-to-one instrumental lessons, side-by-side rehearsals and mentoring, then please get in touch. Royal Birmingham Conservatoire has strong links with In Harmony Telford & Stoke, the largest ‘El Sistema’ inspired initiative in the UK for young people and their families. Our students and staff are committed to providing opportunities for all people regardless of age, ethnicity and social and economic circumstances to access high quality music education. If you work for a charity or social organisation and have an idea of how we might collaborate please contact us. Royal Birmingham Conservatoire has an extensive network of organisations that we deliver multi levels programmes with over several academic years. We are committed to working in partnership to develop exciting and inspirational opportunities for young musicians through collaborative planning and delivery. This has included applying for funding together to make things happen. If your organisation is interested in becoming a strategic partner get in touch. Got an idea for a project, get in touch! Tel: +44 (0)121 331 5912.